At least eight people were killed in an anti-regime demonstration in Sudan’s Darfur region on Tuesday when over 1,000 people took to the streets to protest high fuel prices and the brutality of President Omar al-Bashir’s 23-year-long rule. This demonstration was the latest and largest in a series of protests that have swept through Sudan since Bashir announced new austerity measures in June. The most recent protest erupted in the South Darfur’s provincial capital Nyala a day after the government raised the price of a gallon of fuel by 40 Sudanese pounds, mobilizing public transportation drivers, students, and citizens to take to the streets demanding the end of the Khartoum regime. Protesters blocked the roads and damaged several buildings, prompting the police to fire live ammunition at the crowd, according to several news reports. Previous protests in Nyala were relatively small. The activist group Sudan Change Now, which maintains that 12 people were killed, recently released a list of the names of the protesters killed, most of whom were high school students. Over 50 people were injured. The deaths sparked further demonstrations on Wednesday among protesters demanding justice for the killings. 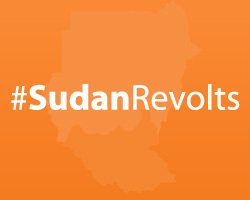 They called for the overthrow of the state governor and the Khartoum government. Witnesses reported that police fired tear gas and gunfire was heard. Tuesday July 31 marks a bloody day that Sudanese will live to remember…We appeal to all people of conscience and in particular to Hillary Clinton, who is visiting the region soon, to send a clear and loud message to Khartoum to stop killing innocent peaceful demonstrators. This pattern of police brutality is not something new to this wave of anti-regime protests, which began at the University of Khartoum on June 16. According to the activist group Girifna, security forces have repeatedly used tear gas, rubber bullets, and arbitrary arrests to suppress peaceful protesters. Moreover, Girifna has reported that over 2,000 activists have been detained since June 16. Some protesters have been detained for several weeks, like the activist Abdul-Hadi Mahmood, who has been held in police custody for 30 days without any charges or trial. Other activists face charges that may result in the death penalty. The human rights activist Rudwan Dawod, whose family lives in Oregon, was arrested while participating in a nonviolent demonstration and currently faces charges of “criminal organization and terrorism,” which in Sudan can be punishable by death. Although the U.S. State Department and the European Union have condemned the harsh police crackdown, Bashir continues to use indiscriminate force against peaceful protesters. The Sudanese government’s violent attempts to quell the protests seemed to be having their desired effect, with demonstrations subsiding during the past two weeks and activists reporting that the crackdown had deterred many city residents from leaving their homes. But the large protests in Nyala this week suggest that the provincial capital will be a new front in the largely student-led, ongoing demonstrations against the government that are steadily expanding beyond Khartoum and its environs. The severity of the police response also generates fresh attention to the Bashir regime’s increasingly desperate attempts to rein in the anti-regime movement.